'Until Great Birnam Wood to high Dunsinane Hill shall come against him.' Photo by Brinkhoff Mogenburg. 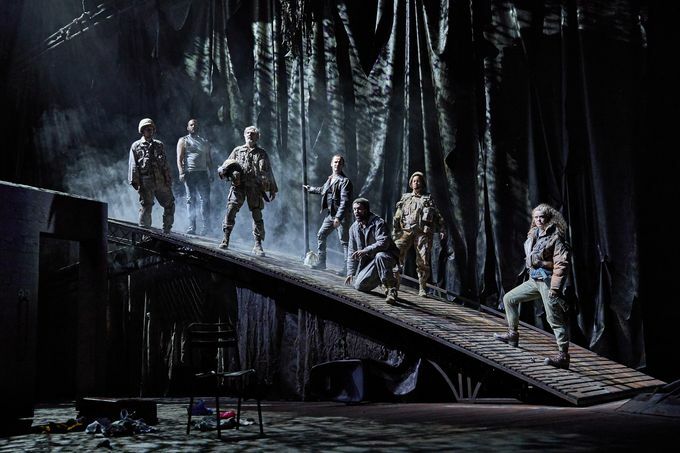 True to Shakespeare’s most intense tragedy, the National Theatre’s production of Macbeth portrays society brutally, honestly and self-destructive in a world infected with an overwhelming thirst for power. Most impressively, the set on which cast moved fluidly is fully mobile, allowing surroundings to morph seamlessly from one dilapidated post-modern apocalyptic shell to another. Moving as if on a conveyor belt, Birnam Wood becomes Dunsinane Hill, becomes Macbeth’s final resting place, placing the large sloped wooden structure at the very centre of the production. Macbeth’s fortune is laid bare by Michael Nardone, giving rise to a kind of torn affection for the hopelessly ambitious Thane of Cawdor. His lust for power is infectious and is found in copious amounts within Kirsty Besterman’s unforgiving portrayal of Lady Macbeth. A few things are for certain: audiences at the Sheffield Lyceum will enjoy the dulcet tones of a more Northern depiction of this Shakespearian tragedy, and notice that the clever stage design is paramount to the quick succession of unfortunate events. Equipped with trap doors, ramps and mobile festoon lights, we witness set fluidity at its very finest, as we follow Macbeth on his path to eventual hamartia. National Theatre's Macbeth runs at the Sheffield Lyceum now until 24 November. Tickets can be purchased from Sheffield Theatres’ Box Office in-person, by phone on 0114 249 6000 or online.